Home Campaigns Hana Shalabi Take action today for Hana al-Shalabi – administrative detainee and hunger striker! Hana al-Shalabi, an imprisoned Palestinian held under administrative detention without charge or trial, has been engaged in an open-ended hunger strike since her re-arrest on February 16, 2012. Now that Khader Adnan’s heroism has opened the eyes of the world to the struggles of Palestinian prisoners, it is imperative to keep the pressure on for Hana al-Shalabi. TWEET NOW to share this action alert by clicking here. Hana al-Shalabi – like Khader Adnan – needs international solidarity and support for her case to amplify her voice and that of her nearly 5,000 fellow Palestinian prisoners, and to make it clear that the people of the world will not accept the abuse and arbitrary detention of Palestinians by the Israeli occupation. Send a letter now to Israeli officials demanding her freedom. Hana al-Shalabi was released from an Israeli prison in October 2011 in a prisoner exchange agreement; prior to her release, she had been held for more than 30 months. During that time, she was never charged with any crime nor tried; she spent nearly three years in arbitrary administrative detention. Hana has been on hunger strike since February 16. On February 23, Hana’s parents both joined in her open-ended hunger strike. 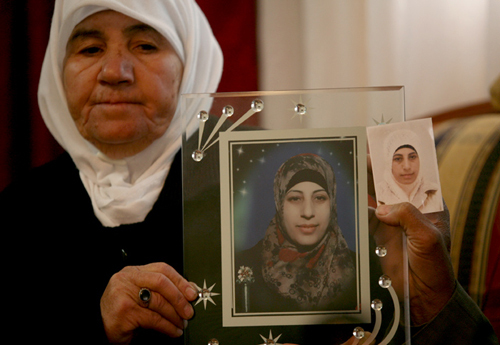 Hana’s brother, Samir, was killed by Israeli occupation military forces invading their village of Burqin in September 2009, and her sister, Huda, was also previously held without charge or trial under administrative detention. After only four months released, Hana was once again arrested – and again, not accused of any crime. Once again, she has been sentenced to six additional months of administrative detention – renewable indefinitely, held arbitrarily. The targeting of Palestinian former prisoners for re-arrest and continued arbitrary administrative detention is not uncommon – Khader Adnan himself spent eight terms in administrative detention. Administrative detention violates the right to a fair trial as recognized in the International Covenant of Civil and Political Rights. It is a practice that is used to silence Palestinians without ever exposing the reality of such actions to the light of day – even in the rigged military court systems. Amnesty International has joined Palestinians and prison rights activists in demanding an end to administrative detention. Administrative detainees have vowed to boycott their hearings, demanding an end to the injustice. Hana al-Shalabi’s hunger strike is a demand for dignity, for justice and freedom, building on the sixty-six day hunger strike of Khader Adnan, which drew the eyes of the world to the bitter reality of administration through his courage and sacrifice. Hundreds of Palestinian prisoners participated in a 23-day hunger strike in October 2011, demanding an end to isolation, abuse, denial of family visits, and the long-term isolation of Palestinian leaders such as Ahmad Sa’adat; Israeli promises to end isolation, aimed to secure the end of the strike, proved to be false. Hana al-Shalabi must be released immediately, and international action is urgent. Samidoun Palestinian Prisoner Solidarity Network urges the Palestine solidarity movement in North America and around the world to publicize the case of Hana al-Shalabi and all Palestinian political prisoners. 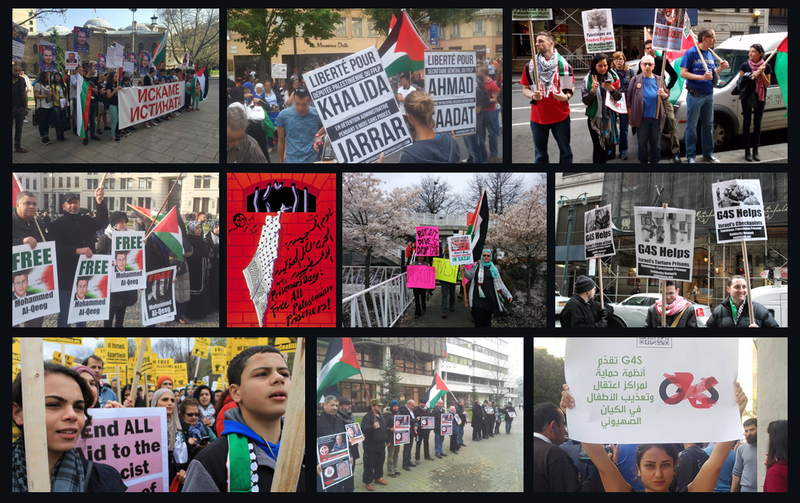 Join in the call for an April 17 day of action for Palestinian prisoners’ day! Contact Israeli occupation officials and demand Hana al-Shalabi’s release. Sign your letter here. Send a fax as called for by FreeHana.org to occupation officials: Minister of Justice, Yaakov Neeman, fax: + 972 2 670 6357; Deputy Prime Minister and Minister of Defence Ehud Barak, fax: + 972 3 691 6940; Commander of the IOF in the West Bank, Major-General Avi Mizrahi, fax: + 972 2 530 5724. Click here for free fax service. Write to the International Committee of the Red Cross and other human rights organizations to urge them to act swiftly to protect Khader Adnan and all Palestinian political prisoners. Email the ICRC, whose humanitarian mission includes monitoring the conditions of prisoners, at jerusalem.jer@icrc.org, and inform them about the urgent situation of Khader Adnan. Make it clear that arbitrary detention without charge or trial is unacceptable, and that the ICRC must act to protect Palestinian prisoners from cruel and inhumane treatment. Keep sharing Hana’s story on social media. Thank you for taking action. This campaign is now closed.